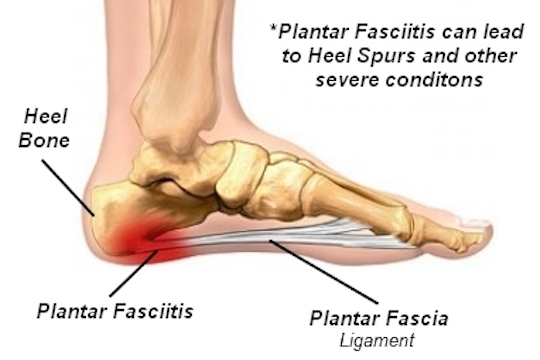 Plantar fasciitis is thickening of the plantar fascia, a band of tissue running underneath the sole of the foot. The thickening can be due to recent damage or injury, or can be because of an accumulation of smaller injuries over the years. Plantar fasciitis can be painful. Plantar fasciitis is caused by straining the ligament that supports your arch. Repeated strain can cause tiny tears in the ligament. These can lead to pain and swelling. This is more likely to happen if your feet roll inward too much when you walk ( excessive pronation ). You have high arches or flat feet. You walk, stand, or run for long periods of time, especially on hard surfaces. You are overweight. You wear shoes that don't fit well or are worn out. You have tight Achilles tendons or calf muscles. The most common symptoms of plantar fasciitis include pain on the bottom of the foot near the heel, pain with the first few steps after getting out of bed in the morning, or after a long period of rest, such as after a long car ride. The pain subsides after a few minutes of walking. Greater pain after (not during) exercise or activity. Your doctor will ask you about the kind of pain you're having, when it occurs and how long you've had it. If you have pain in your heel when you stand up for the first time in the morning, you may have plantar fasciitis. Most people with plantar fasciitis say the pain is like a knife or a pin sticking into the bottom of the foot. After you've been standing for a while, the pain becomes more like a dull ache. If you sit down for any length of time, the sharp pain will come back when you stand up again. Many types of treatment have been used to combat plantar fasciitis, including injections, anti-inflammatory medications, orthotics, taping, manipulation, night splinting, and instrument-assisted soft-tissue manipulation (IASTM). IASTM begins with heat, followed by stretching. Stretching may be enhanced by applying ice to the plantar fascia. These stretches should be performed several times per day, with the calf in the stretched position. IASTM uses stainless-steel instruments to effectively access small areas of the foot. IASTM is believed to cause a secondary trauma to injured soft tissues as part of the healing process. Therapeutic modalities such as low-level laser, ultrasound, and electrical muscular stimulation may be effective in the reduction of pain and inflammation. Low Dye strapping or taping of the foot is an essential part of successful treatment of plantar fasciitis. Extracorporeal shock-wave therapy (ESWT) was introduced with great promise at one time. Recent studies have reported less favorable results. Some report no effect. Previous local steroid injection may actually have a negative effect on results from ESWT. The most common surgical procedure for plantar fasciitis is plantar fascia release. It involves surgical removal of a part from the plantar fascia ligament which will relieve the inflammation and reduce the tension. Plantar fascia release is either an open surgery or endoscopic surgery (insertion of special surgical instruments through small incisions). While both methods are performed under local anesthesia the open procedure may take more time to recover. Other surgical procedures can be used as well but they are rarely an option. Complications of plantar fasciitis surgery are rare but they are not impossible. All types of plantar fasciitis surgery pose a risk of infection, nerve damage, and anesthesia related complications including systemic toxicity, and persistence or worsening of heel pain.